This pattern occurs during a downtrend. The first day's black candlestick is followed by a white candlestick that opens sharply lower and closes at the same level as the prior sessions close. It is similar to the Piercing Line pattern. However the amount the second day rebounds is different. The Piercing Line?s second day closes above the midpoint of the first day's body while the second day the Bullish Meeting Line closes the same as the first day. Consequently the Piercing Line is a more significant bottom reversal. Nonetheless the Bullish Meeting Line deserves due respect as well. 3. Then we see a white candlestick on the second day. The Bullish Meeting Line consists of two candlesticks first a black candlestick then a white candlestick; both not short. The closing prices of both days should be the same or almost the same. The occurrence of this pattern reflects a stalemate between bulls and bears. 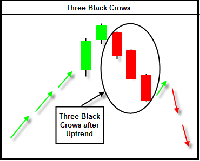 The market is in a downtrend when a strong black candlestick is formed which further supports the trend. The next day opens sharply lower causing the bears to feel more confident. Then the bulls start a counterattack pushing prices up and leading to a close equal to (or very close to) the previous close. The downtrend is now breached. The stop loss level is defined as the last low. Following the BUY if prices go down instead of going up and close or make two consecutive daily lows below the stop loss level while no bearish pattern is detected then the stop loss is triggered. 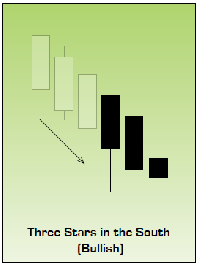 A three day bullish reversal pattern that is very similar to the Morning Star. The first day is in a downtrend with a long black body. The next day opens lower with a Doji that has a small trading range. The last day closes above the midpoint of the first day. 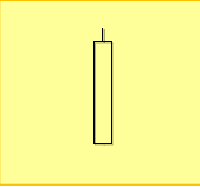 A three day bullish reversal pattern consisting of three candlesticks - a long-bodied black candle extending the current downtrend a short middle candle that gapped down on the open and a long-bodied white candle that gapped up on the open and closed above the midpoint of the body of the first day. This candlestick represents extreme bullishness and it is characterized with a long white body that has an upper shadow but no lower shadow. 2. There is no lower shadow. 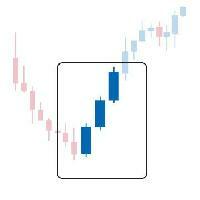 The white body of the candlestick should be longer relative to the other candlesticks on the chart. It has a shadow on the closing side but no shadow on the opening side. 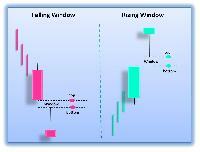 A White Opening Marubozu indicates that buyers controlled the price action from the first trade to the last trade. The day opens and prices continue to go up all day long without looking back thus forming a long white day with no lower shadow. However the day does not close at the high of the day and thus creates an upper shadow. The candlestick is generally bullish. However its position within the broader technical picture is also important. It may show a potential turning point and that prices have reached a support level after an extended decline (Bullish Belt Hold Pattern). If it is seen after a long and significant rally it may point to excessive bullishness and that prices are at dangerously high levels. Still the candlestick alone is not reliable enough to decide the direction of the markets since it reflects only one days trading. This candlestick has a tiny black body with upper and lower shadows that have a greater length than the body. It is accepted as a type of Doji and will act as a Doji when it appears. 1. The body of the candlestick is black and very small. The black body of the candlestick should be very small. The lengths of the shadows should be greater than the length of the body. The market moves higher and then sharply lower or vice versa. It then closes below the opening price creating a tiny black body. This represents complete indecision between the bulls and the bears. The actual length of the shadows is not important. The small body relative to the shadows is what makes the spinning top. If a Black Spinning Top is observed after a long rally or long white candlestick this implies weakness among the bulls and it is a warning of a potential change or an interruption in the trend. If a Black Spinning Top is observed after a long decline or a long black candlestick this implies weakness among the bears and it is a warning of a potential change or an interruption in the trend. Like most other single candlestick patterns the Black Spinning Top has low reliability. It reflects only one day's trading and can be interpreted both as a continuation or a reversal pattern. This pattern must be used with other candlesticks to confirm a trend. The market moves higher and then sharply lower or vice versa. It then closes above the opening price creating a tiny white body. This represents complete indecision between the bulls and the bears. The actual length of the shadows is not important. The small body relative to the shadows is what makes the spinning top. If a White Spinning Top is observed after a long rally or a long white candlestick this implies weakness among the bulls and it is a warning of a potential change or an interruption in the trend. If a White Spinning Top is observed after a long decline or a long black candlestick this implies weakness among the bears and it is a warning of a potential change or an interruption in the trend. Like most other single candlestick patterns the White Spinning Top has low reliability. It reflects only one day's trading and can be interpreted both as a continuation or a reversal pattern. This candlestick needs to be used with other candlesticks to confirm a trend.